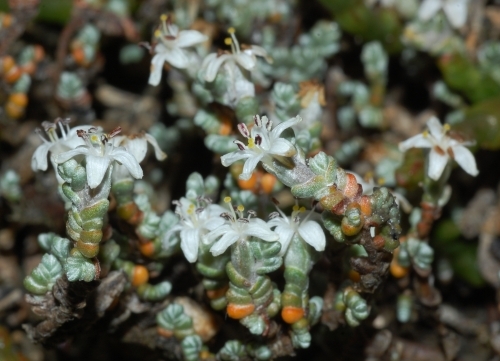 In November 2008 I had the privilege to participate in an African Boxthorn (Lycium ferocissimum) weeding trip at a beautiful saltmarsh in Sorrell with my fellow DPIW colleagues Mick Ilowski and Adam Smith. 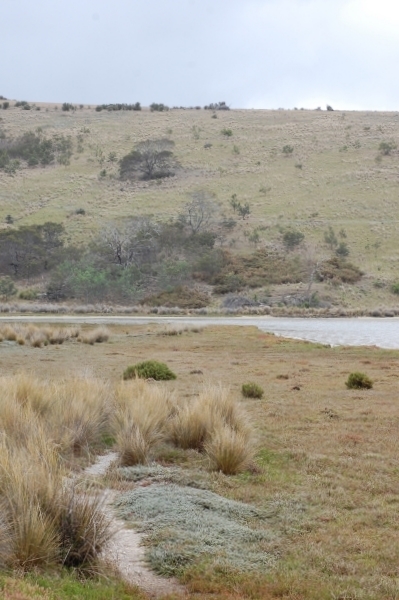 The reason for doing weeding at the saltmarsh was because a threatened species, the Silky Wilsonia (Wilsonia humilis) grows there. 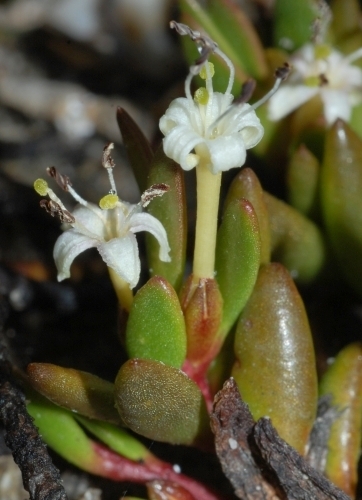 The Silky Wilsonia (Wilsonia humilis) is listed as rare under the Tasmanian Species Protection Act and the African Boxthorn invasion into the saltmarsh would possibly be quite detrimental to the health of the Silky Wilsonia populations there. If you have ever seen morning glories you would never have imagined that Wilsonia humilis is anywhere remotely related to it (see also my post on the Golden Dodder). Unlike it’s typical twinning morning glory cousins, native Tasmanian Wilsonias have succulent leaves and very small flowers (compared to typical morning glories). It is only by virtue of their floral structure that the Wilsonias belong within the morning glory family (Convolvulaceae). I imagine that the Silky Wilsonia would make a fabulous lawn plant. There are simply little words to express the exquisiteness of those succulent greyish and densely overlapping leaves. 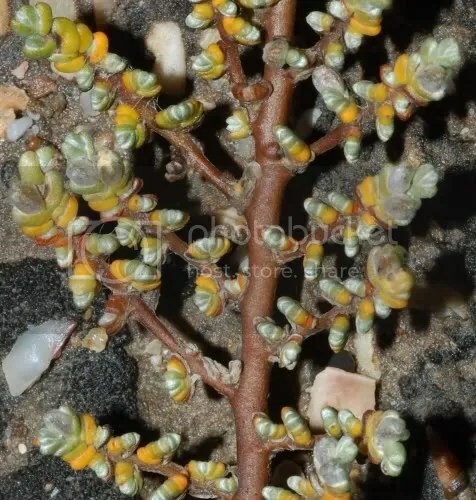 The succulence of the leaves is an adaptation to the saline conditions of the saltmarsh habitat and it never fails to amaze me how numerous unrelated families of plants have adopted succulence in order to survive in saline environments. In any case, the exuberance of Silky Wilsonia in the Sorrell saltmarsh was simply amazing. According to Richard Schahinger, a botanist from DPIW’s Threatened Species Unit, this salmarsh probably has one of the most healthy looking populations of the plant. I can’t disagree. The Sorrell saltmarsh also has another very different looking Wilsonia species there, the Narrowleaf Wilsonia (Wilsonia backhousei). The Narrowleaf Wilsonia is not threatened but is no less fascinating. The thin elongated sky-ward pointing corollas made me think of little trumpets. If I could but hear the tunes they play? This entry was posted in Botany, Fieldtrips, Threatened Plants and tagged Convolvulaceae, morning glory, Narrowleaf Wilsonia, saline conditions, saltmarsh, Silky Wilsonia, Sorrell, threatened Tasmanian plants, Wilsonia, Wilsonia backhousei, Wilsonia humilis. Bookmark the permalink.